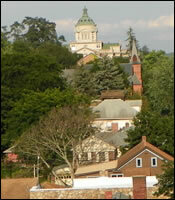 Exploring Pennsylvania Boroughs - Somerset Borough from Triscari on Vimeo. With the help and cooperation of Waste Management Hauling & Southern Alleghenies Landfill, spring clean up will be May 13th. All items must be placed along the road right-of-way before 6:00 a.m. on Monday, May 13th, 2019. All objects, including carpets, must be cut into 4-foot lengths and tied or bundled. no item two men cannot lift. Paint cans accepted only if paint is completely hardened with the lids removed. Limit one large appliance and one large furniture item per household. There is a 500 pound weight limit per household (excluding the furniture and appliance item). There will be no return trips. Residents who do not follow the guidelines will be responsible for removal of items. We are pleased to present to you our 2018 Annual Drinking Water Quality Report. This report is designed to inform you about the quality water and services we deliver to you every day. Our constant goal is to provide you with a safe and dependable supply of drinking water. We want you to understand the efforts we make to continually improve the water treatment process and protect our water resources. We are committed to ensuring the quality of your water. 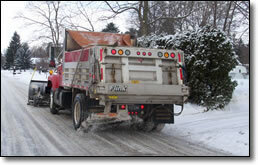 It is the Borough's intention to keep all of its roads plowed and salted this winter. It is our policy to plow and salt any hills and main roads, then side streets and Borough Parking lots. It would help our snow removal efforts if citizens would try to keep from parking along the roads during heavy snow. This way we will be able to keep roads clean more efficiently. It is almost impossible for the equipment operators not to push some snow into driveways that are already plowed. If you must plow your driveway prior to completion of the street plowing, clear an area on the side of the driveway from which the truck will approach. This provides an area for snow to unload before it reaches the driveway. Ordinance Number 1146 requires all owners or occupants of property as tenants, fronting on any of the streets in the Borough of Somerset to keep the sidewalks in front of, or along said properties clear free of snow and ice. This is to help insure that pedestrians pass safely over sidewalks. Read more about the Borough of Somerset Snow Removal Policy. 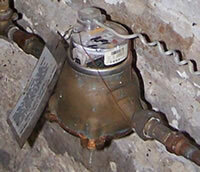 Locate the meter in a place that is heated and out of the wind and weather (like a basement or crawl space). If the meter or water lines are not in a properly heated area, wrap your meter and water lines with insulation and/or heat tapes (Available at local hardware stores). In extreme cases of cold, let one of your faucets run very slowly. A slight increase in your water bill may be better than the costly task of replacing frozen meters, water pipes, or property damage.
" LETTERS OF INTEREST "
The Council of the Borough of Somerset is accepting “letters of interest” from Borough residents interested in serving on its various Boards/Commissions. Presently, Council is looking to fill an unexpired term on its Municipal Authority. A full term is five (5) years. Additionally, there are two vacancies in the Borough’s Uniform Construction Code Appeals Board. A full term is three (3) years. The duties and responsibilities can be obtained from the Borough Manager’s Office. by calling 814-443-2661; by clicking here , or by stopping at the Somerset Borough Municipal Building at 347 West Union Street. 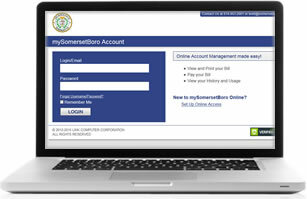 Sign up for your mySomersetBoro account and enjoy account access at your fingertips. All you need is some basic information from your water/sewer bill and a valid email address to get started. With your mySomersetBoro account you can view your bills Online, view your usage and payment history and make Online payments from your checking account or by credit card. Don't want a paper bill, go completely paperless and sign up for ebills. The Borough of Somerset does not charge a fee for Bank Account (ACH) payments. A third-party fee will apply to all electronic credit card payments. Effective October 1, 2016 Fee for credit cards is 2.65% or $3.00 minimum charge. windows / open doors etc. •	To construct, enlarge, alter, or demolish a structure. •	When sanitary facilities (water / sewer) are added. •	When a proposed change occurs in the use of a building. A comprehensive listing of activities requiring permits is available at our Inspections Department; by calling Building Inspector Tom Jury at 445-5595; and on our web site www.somersetborough.com. Somerset Borough reminds residents not to place signs on trees or utility poles. 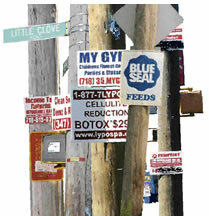 The Somerset Borough Zoning Ordinance prohibits signs from being attached to trees or utility poles. Recently there have been incidents of yard sale signs being placed on trees, utility and sign poles, as well as traffic signal poles. This is a violation of Section 183-34 of the Somerset Borough Zoning Ordinance, and is subject to a fine of up to $250 per day for each violation. 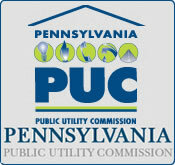 Council The Pennsylvania Sunshine Act (65 Pa. C.S. 701, et seq.) provides that the Board or Council of a political subdivision shall provide a reasonable opportunity at each advertised regular meeting and advertised special meeting for residents of the political subdivision or for taxpayers of the political subdivision or to comment on matters of concern, official action or deliberation which are or may be before the Board or Council prior to taking official action. (710.1).